Rep John Conyers, Chair of the House Judiciary Committee, is one of the most powerful men in the US Congress. He is also arguably the Communist Party USA's best friend in the US government. So what. Who cares about a few old commies in this day and age? In a recent post How Communist Parties Influence Your Government I detailed how parties like the CPUSA routinely and covertly, influence government policy. In a nutshell, a communist party will develop a policy then use sympathisers and or covert members in a mainstream political party to get the proposal passed into law. The Communist Party USA has several sympathisers in the US government it seems to use for such purposes. The article below is a very good example of a senior Democrat promoting what is essentially Communist Party policy. I add some commentary in explanation. PA Detroit, Michigan (12-15-06) – Appearing at a town hall meeting in Detroit, Rep. John Conyers (D-MI) called for a "new American agenda" for the next session Congress. Conyers discussed a wide range of issues from the war in Iraq to the economy, health care, and the impeachment of President Bush. He declared the new session of Congress, set to begin on January 4, 2007, a "brand new start after 12 years" of disastrous rule by the Republican Party. "You are now being addressed by Chairman John Conyers of the House Judiciary Committee," Conyers told an overflowing audience at the University of Detroit Mercy. He promised to use his authority and influence to help reverse the irresponsible lack of congressional oversight by the Republican-controlled House of the President on issues such as the war and the abuse of civil liberties. Conyers proceeded to discuss his opinion on a number of major issues that he intended to address from his new position in Congress. He cited D.C. statehood as one of the first items on the list. New Zeal DC statehood has been a CPUSA policy for years. Why? Because every state gets two Senators. Predominantly black Washington DC votes overwhelmingly Democrat and is a stronghold of the CPUSA influenced "progressive" movement. If DC gets statehood, this would almost certainly mean two more Democrat Senators. This would make it more likely for the CPUSA infiltrated Democrats to win future Senate elections. PA Conyers also chastised the Bush administration for its hostility for international law and treaties. Citing the administration’s efforts to undermine the Geneva Conventions, its refusal to follow guidelines in treaties signed by the U.S. regarding nuclear disarmament, and its mishandling of "genocide issues," Conyers argued, "Without international law the planet can not go on, and we can not make an attempt to address and control war and divisions that exist in the world today." Conyers announced that he and Rep. Dennis Kucinich (D-OH) intended to re-introduce a bill in the House that would create a cabinet level Department of Peace. "Somebody on the national level," Conyers noted, "has to be studying how to make peace." Conyers also congratulated Kucinich on his announced intention to run for the Democratic Party’s nomination for president. Conyers said that Kucinich would be the "most progressive candidate" in the field. New Zeal Kucinich, together with Barbara Lee is the CPUSA's other "best friend in Congress". On July 11, 2001, Rep. Dennis Kucinich (D-Ohio) introduced HR 2459, a bill that called for the creation of a cabinet-level Department of Peace. On his website, Kucinich states “violence at home, in the schools, in the media, and between nations has dragged down humanity. It’s time to recognize that traditional, militant objectives for peace are not working, and the only solution is to make peace the goal of a cabinet level agency.” The bill was referred to the House Subcommittee on 21st Century Competitiveness, where its life was ended in the 107th Congress. The bill had 44 sponsors, most, if not all, members of the Progressive Caucus. One of the more outspoken sponsors of the bill was Rep. Barbara Lee (D-Calif.), who represents the Berkeley and Oakland areas. 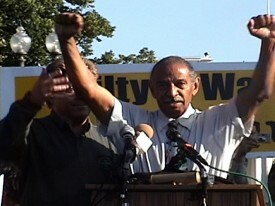 Lee stated that “the establishment of this new Federal agency will provide us with the tools and resources necessary to move towards peace in our communities and worldwide.” Lee later received national attention for being the only representative in Congress to vote against giving Bush unlimited powers in the war against terrorism. PA In addition to these major issues, Conyers promised that his committee would open investigations of a number of concerns raised under Republican control of the House over the course of the Bush presidency. He said his committee would reexamine major abuses of civil liberties such as the PATRIOT Act and the Bush administration’s warrantless wiretapping program. Congress has the duty to "cut the PATRIOT Act down to size" and to "cut back Bush's power grab." Conyers refused to introduce articles of impeachment, saying that such a move required much more popular support, a bipartisan effort in Congress, and a stronger Democratic majority to accomplish. New Zeal I quote Tim Wheeler of the National Committee the Communist Party USA speaking at a recent gathering of 62 communist parties in Lisbon. Republican loss of the House means that Rep. John Conyers (D-Mich), a leader of the Congressional Black Caucus, a former Detroit auto worker, will become chairman of the House Judiciary Committee. His legislation calling for a full investigation of Bush and his decision to invade Iraq can now go forward. Conyers also introduced a “Resolution of Inquiry” on possible grounds for impeaching Bush and Cheney. Conyers has been under pressure from his colleagues in the CPUSA linked Progressive Democrats of America, to impeach President Bush, but at this stage will only push for a more limited investigation of the president. PA He called for revamping foreign policy efforts, opening talks with regional powers in the Middle East, talks with North Korea and China rather than confrontation, and for the U.S. "to take the lead on disarmament." New Zeal No prizes for guessing who else supports such a stance towards China, North Korea and certain "Middle Eastern powers". PA Conyers added support for proposed reforms that would address global warming, protections for pensions, and a Constitutional amendment being offered by Rep. Jesse Jackson, Jr. (D-IL) that would make health care a right. In closing, Rep. Conyers called for "a people's agenda" that provides "jobs, justice, and peace." Why am I not surprised that the Communist movement is backing the fellows who are spearheading the Impeach Bush movement? go on - Trevor, you didn't need to BEGIN. what a numbingly boring post. you are losing your touch. more good oldfashioned truth type exposees about New Zealand please. Fair enough anon. Got to look after the local punters first. Any particular Kiwi Kommie you'd like me to shine the spotlight on? When a Marxist-Leninist talks of "peace" he doesn't mean an absence of warfare between nation states, which would be most of us would understand by the term. He means instead a world in which all opposition to the imposition of Communism has ceased. For the enlightenment of the ignorant, that's a world in which you do what you're told or get shot. Revelation 13:5 - Are we in this 42 month period?